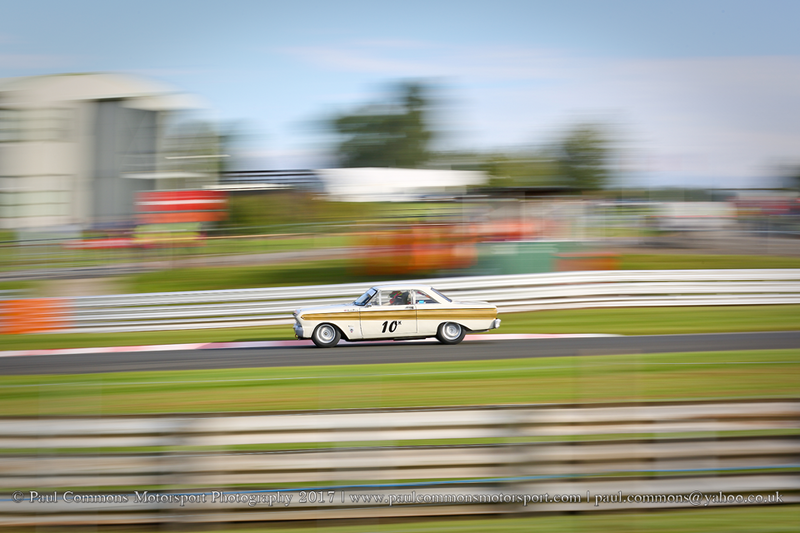 Already an excellent event, the Oulton Park Gold Cup stepped up yet another gear in 2017 with the addition of both the Historic Touring Car Challenge and FIA Historic F2 International Series. 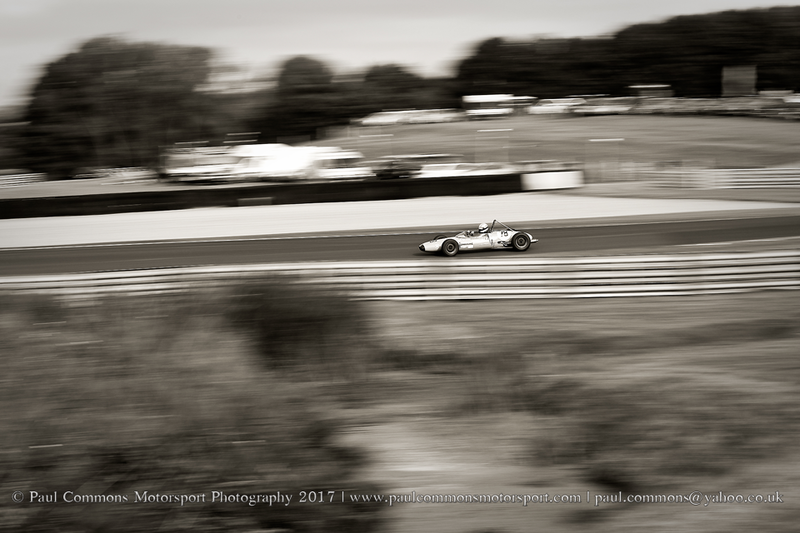 And, when considering the ultra competitive HSCC Historic Formula Ford and Pre-66 Touring Car championship events featured heavily on the Bank Holiday Monday undercard, the more than respectable crowd were in for a real treat. 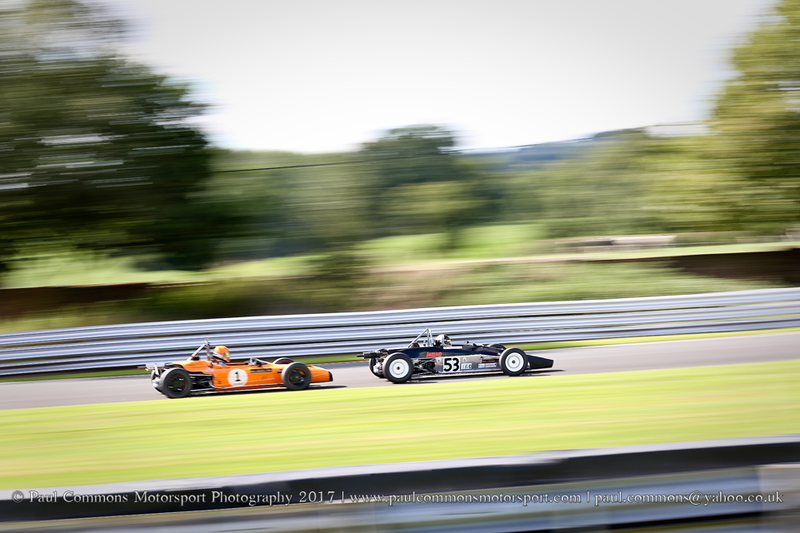 The HSCC organised Historic F2 championship appears to have suffered very little from the emergence of Peter Auto’s rival series in 2017 with some 25 cars taking to the Cheshire track over the weekend. And whilst Darwin Smith dominated proceedings in race 1 to claim victory by 17 seconds, he would have his work cut out in race 2 as the event quickly turned into a two horse race. Donington winner, Richard Evans is regularly a front runner in this category and on this occasion refused to let the Northern Irishman out of his sights as the two bright yellow machines pulled away from the pack. But, despite Evans’ best efforts he never really got close enough to challenge; the series returnee, in his formidable March 722, appearing unbeatable around the picturesque parkland circuit as he went on to record his second victory in as many days. The Gold Cup, awarded to the aggregate winner of the 2 F2 races, just reward for Smith’s utterly brilliant drive. 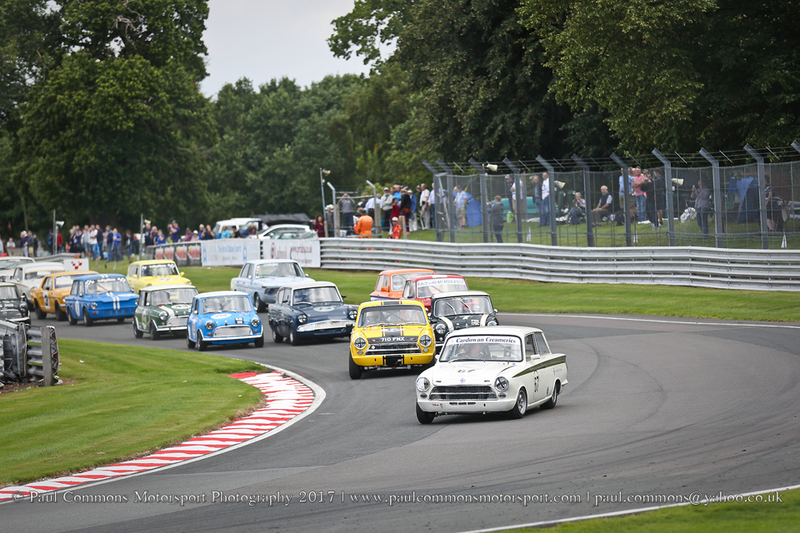 The Motor Racing Legends organised Historic Touring Car Challenge was a very welcome addition to the Bank Holiday Monday schedule where, for a trial period commencing with the Gold Cup, Group A RS500s have been allowed to join the party. And whilst Chris Ward claimed pole position for the 50 minute race with a late charge in the JD Classics Rover Vitesse (shared with Steve Soper), it was the Mark Wright piloted RS500 which leapt into an early lead; his pace over the opening laps as he pulled away from Ric Wood’s Capri and the pole sitting Rover possibly the reason why these machines had previously been off the menu! Having dominated earlier in the season at Donington Park, Soper was not quite able to deliver the same level of performane at Oulton. Ward on the other hand is rapid everywhere and an early stop to get the ex Silverstone Chief Driving Instructor behind the wheel would pay dividends as Ward found himself in the lead of the race as the mandatory pitstops unwound. Had it not been for fuel starvation issues, Dave Coyne, in the RS500 started by Wright, may well have challenged for victory. However the intermittent problem would play havoc throughout the second half of the race with the 1990 Formula Ford Festival winner doing well to salvage fourth 4th with a last lap charge. As it was, despite suffering a braking issue, Ward was able to take a comfortable victory in the end, with the Capri of Ric Wood and the late stopping M3 E30 of Mark Smith rounding out the podium positions. This had been a classy drive by the JD Classics man and Soper was the first to acknowledge that Ward was largely to thank for their top step of the podium appearance. 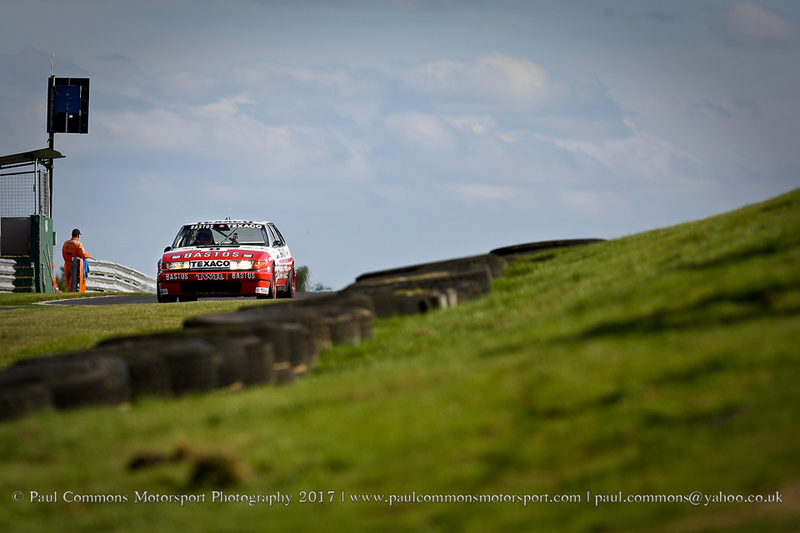 This wasn’t the only touring car action of the day however with the schedule also including 2 historic touring car races for the pre-66 machines as well as a second encounter for the end of millennium Super Tourers. The Honda Accord is often the car to beat in the HSCC run Super Touring Car Trophy and the second race at Oulton provided no surprise in this respect; Stewart Whyte heading a 1-2 for the Japanese brand to register his second victory of the weekend. Meanwhile, Gianfranco Brancatelli claimed 6th position overall to take class A honours in the very same RS500 he drove to Spa 24 hour victory in 1989. Qualifying for the Pre-66 machines saw Ford Falcon pilot, Jack Drury, require just 4 laps to take pole position by a massive 1.4 seconds. It was to no avail however as a broken oil pump, which cut short his qualifying session, also caused him to miss race 1 whilst the engine was changed! This left the door open for the smaller engined marques to flourish with James Clarke leading home Richard Belcher to complete a Ford Cortina 1-2 and Jonathan Lewis in his Mini Cooper S registering an excellent third. The Falcon was fixed for race 2 however and despite having to start from the back of the grid, Drury was in the lead of the race before the end of lap 4; his victory by more than 13 seconds underlining his total dominance of the category on the day. With such a performance gap, a double race victory should have been a formality and the ex BMW driver will hope his championship push is not impacted by the unfortunate reliability issues experienced in qualifying. 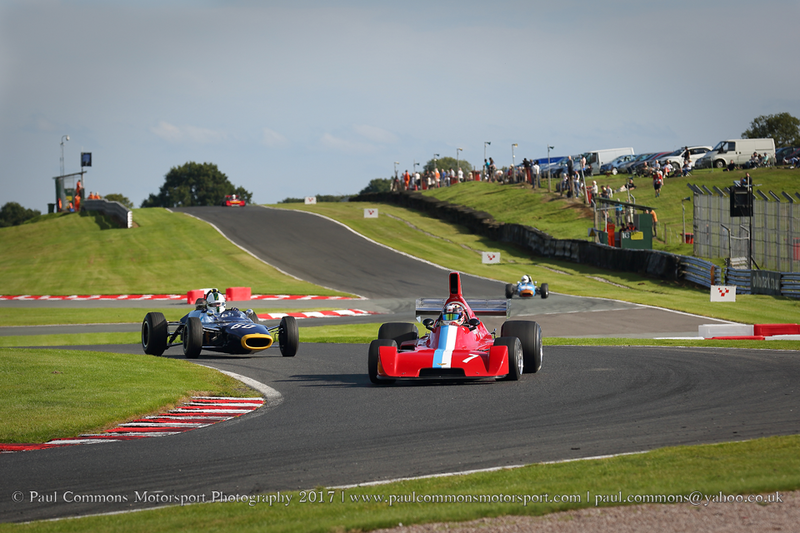 As has often been the case in 2017 a healthy grid of Formula Ford machinery had been gathered for the Oulton Park Gold Cup meeting and it was no surprise to find Richard Tarling and Callum Grant again battling it out for victory. But whilst overtaking was plentiful at Croft, it was not so easy at Oulton and try as Grant might he could not find a way passed the Janum T2 of Tarling in either race; Tarling again showing his defensive skills to record a double victory despite suffering a broken exhaust in the days first encounter. And whilst Tarling’s two strong results kept him well in the title frame, a distinctly under the weather Grant (2016 champion) all but threw in the towel following another strong points haul for series leader Michael O’Brien. Benn Tilley put in 2 strong Formula Ford performances to claim creditable 6th and 7th placed finishes but it was the Formula Junior category where the youngster truly excelled; the Lotus 22 pilot going on to record his first and second overall victories in the Silverline backed series as John Fyda and Peter De La Roche, on both occasions, rounded out the podium positions. In the Second Derek Bell Trophy race of the weekend, a drive train problem with his March 79B denied Andrew Smith the chance of a double win. 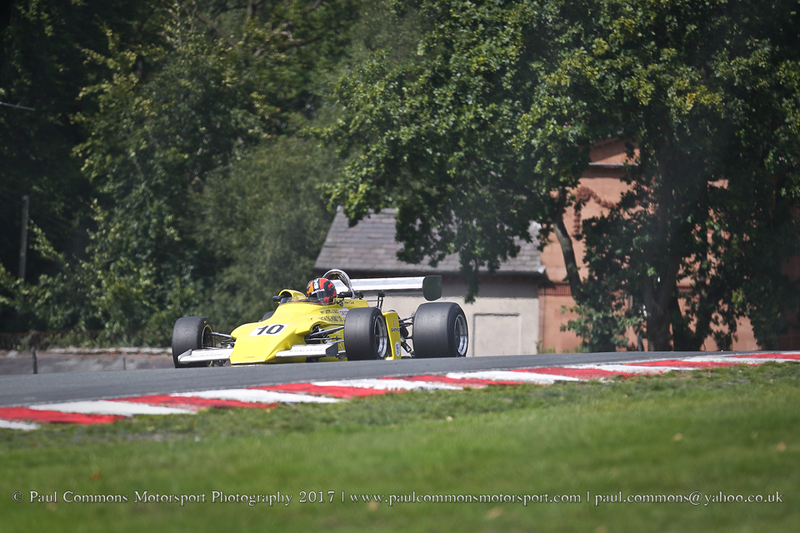 Instead, Neil Glover powered his F5000 Chevron B37 to victory as the 2 litre F2 Chevron B27 of Mike Bletsoe-Brown and the March 712 of James King, fresh from his brilliant F2 performance to claim class A honours, rounded out the podium positions. Behind, Julian Stokes came out on top of the Techno F2 battle to claim Classic Racing Car victory with race 1 winner, Daniel Pyett unfortunately ending the day in the Old Hall barriers. And last but not least, there looked to be a huge shock on the cards in the Classic Clubmans race as John Harrison lead much of the early running. 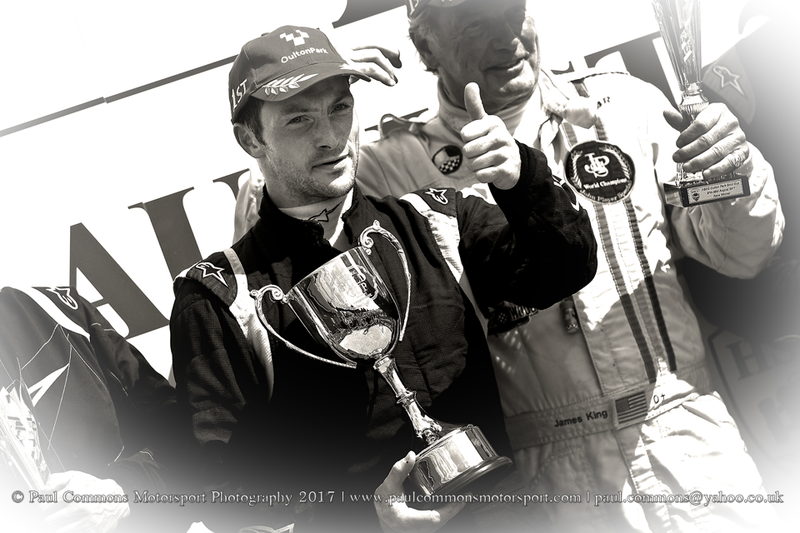 Mark Charteris is very rarely beaten in this category however and would not be denied on this occasion either; the Watford man making the crucial pass at Cascades on lap 8 before going on to record a 3.6 second victory. Was there a better way to spend August Bank Holiday Monday? I think not. Having absolutely loved the Gold Cup meeting last year I wasn’t sure it could be bettered. I was wrong. 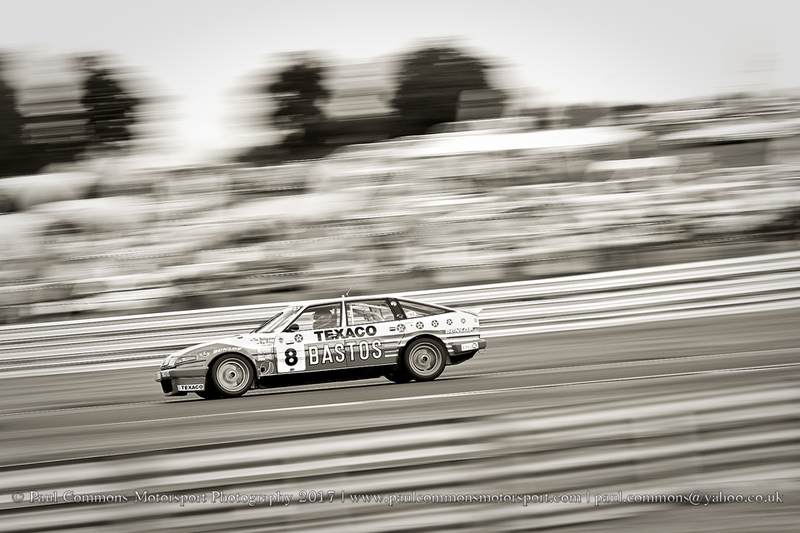 Witnessing historic F2 machinery lapping Oulton in sub 1.36 times is something else, as was the sound of many a V8 at full chat in the Historic Touring Car Challenge. More of the same next year please!